It started three years ago. My best friend had a baby and I didn't give her the option. I told her, "I'm making Nola's first birthday cake. Just so you know." Thankfully, she was fine with that. 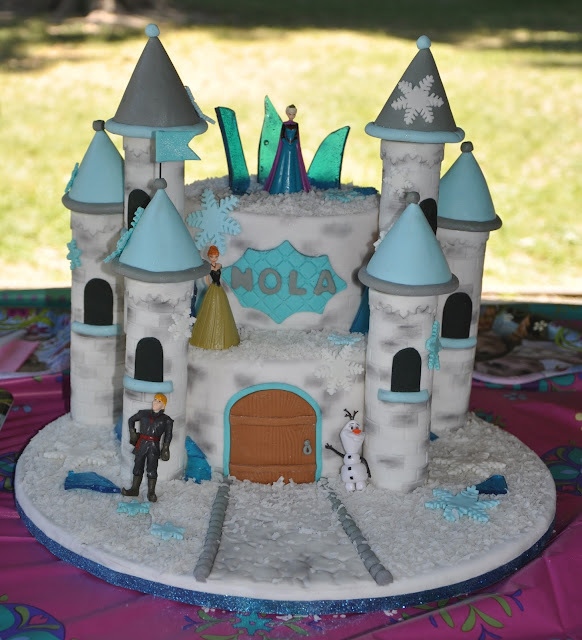 Fast forward three years to Nola's third birthday party with a Frozen theme. Before I even knew what I was going to make Nola was pumped for her birthday cake. Funny thing is, Nola doesn't really even like cake. So, I decided a castle cake would be nice and grand. Something exciting for her to look at. This is the cake I ended up with. I wish you could see the brick impression on the picture, but you get the idea. Instead of just making a castle cake I wanted to have a bit of Elsa's frozen ice palace as well, which is what is at the top of the cake.